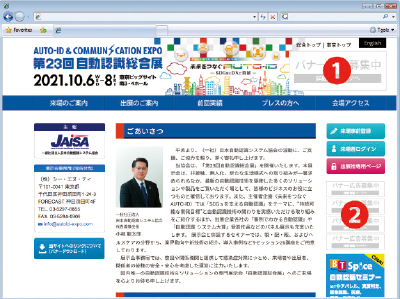 You can run banner advertisements and menu bar advertisements at the official homepage for the AUTO-ID & COMMUNICATION EXPO 2019. We will post the Auto ID Expo official website from the end of February to the end of October. A wealth of information is posted at the official website, including detailed information on the Expo and exhibit information from exhibitors, as well as numerous speeches every year from relevant people in the industry. Please use the following advertising plan, which is set for the official site from this year going forward. The plan provides the opportunity for you to effectively promote your company prior to the time of the Expo in order to draw visitors to your booth. * The application period ends if all time slots are filled.